Last February I visited URWERK in Geneva and while I was talking to Press Manager Yacine Sar, about the UR-210, she surprised me completely by presented me the brand new UR-105M, that was still under embargo. I did make some quick shots for Suzanne Wong’s article, that appeared a few weeks later on the RevoOnline Blog and can be found HERE. Now 10 months later, I have the UR-105M with me for a couple of weeks, to live my daily life. The watch is available as the ‘Iron Knight’, with a brushed steel armor bezel and as the ‘Dark Knight’ with a black AITiN-treated steel armor bezel, that has been polished to a satin black finish. Both models have a titanium case measuring 39,5 x 53mm. 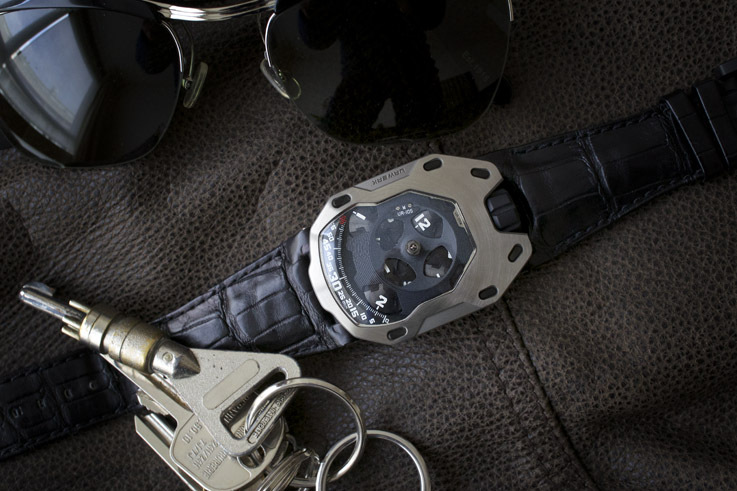 Most people know URWERK well from of the 103 series. 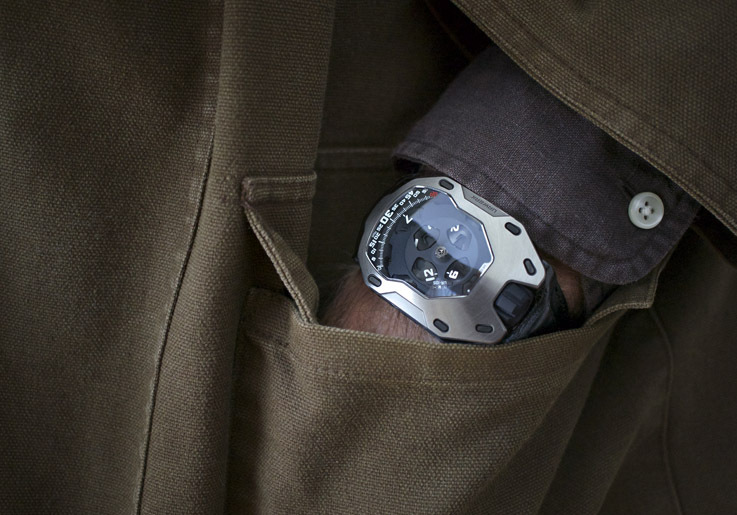 The UR-103 was a timepiece that brought URWERK fame and it was also the watch that remained in the catalogue, for about ten years, in various versions and materials. From a technical point of view, it was, after the UR-102 and UR-101, the most simple URWERK and it was also the entry model of the URWERK collection. Its Star Wars appearance attracted many watch lovers, even the ones that usually go for more classic time pieces. The new UR-105M should be seen as the successor of the UR-103. 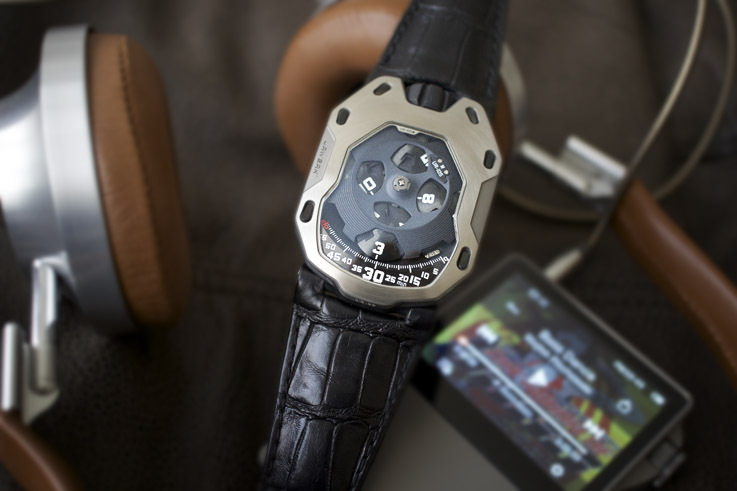 URWERK is not the brand that will repeat itself and since the UR-103 is retired, we can be sure that it will not come back anytime soon or at all. 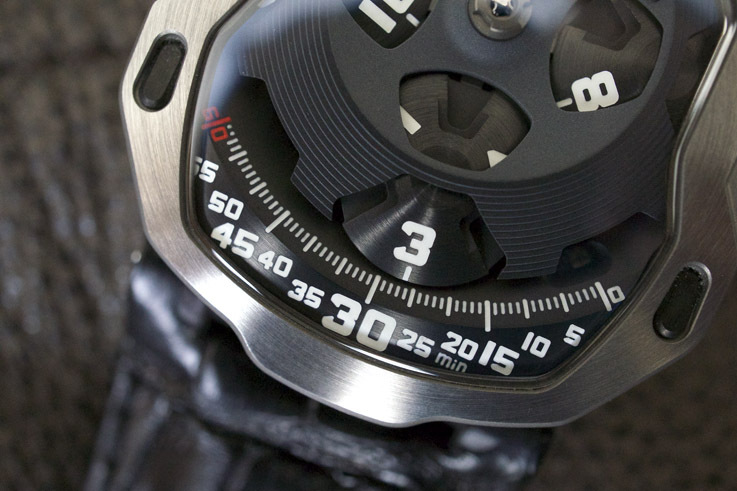 The UR-105M took its place as the new entry model, with a symmetrical case shape that reminds just a little bit of the UR-103 and a pretty familiar time reading scale. The dial and first look of the watch, is as clean and minimal as the 103 series; let’s go more into detail. 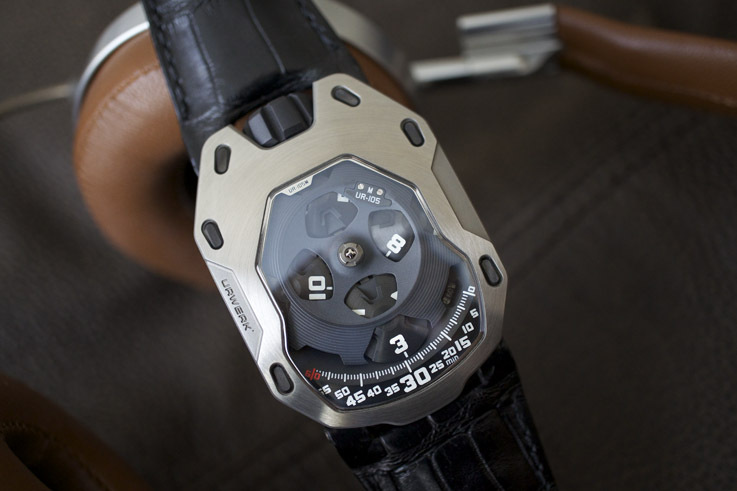 URWERK developed the new 5.01 mechanical caliber for the UR-105M, sporting the well-known satellite display. The four satellites each represent 3 hours. While the appropriate satellite travels along the minute scale, the other three satellites remain just partly visible, under its armor and are therefore less confusing than the display of the UR-103. URWERK is provocation and control. The brand lacks all the rules of classical time reading and it has, as far as now, never released a watch, with two hands…….. at least not under the name Urwerk. Every model works differently and every model reads differently, but what they all have in mind is control. When we look at the back and the side of the watch, it will be clear where I am talking about. Five different windows of the control board, each having their own function. The narrow curved window underneath the brand name, is the fine tuning. Should the watch run a fraction too fast, it can easily be micro adjusted with the steel adjustment screw on the left. The green + and red – make it very easy to do that yourself. The power reserve meter is on the right and the really cool oil change meter on the left. The meter, of the watch I am having here, is in this picture, all the way at the beginning of the scale and still needs at least five years to reach the red field. When it comes in the red zone, it is an indication, that the watch should have its oil change. 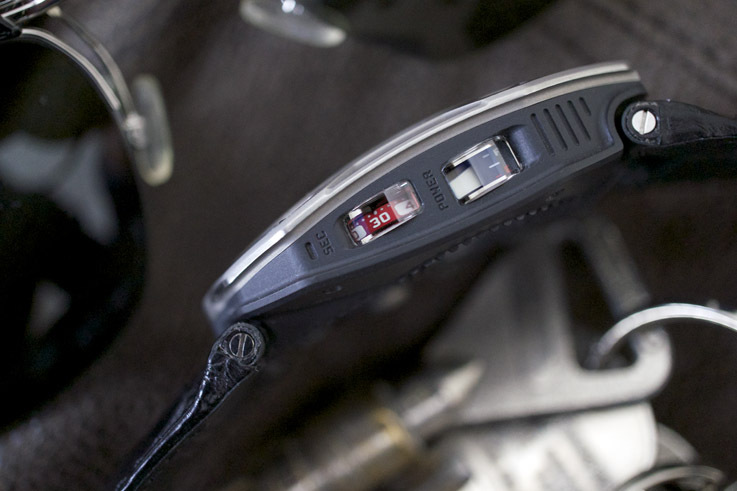 The oil change meter was presented in 2007 when the UR-201 was launched. 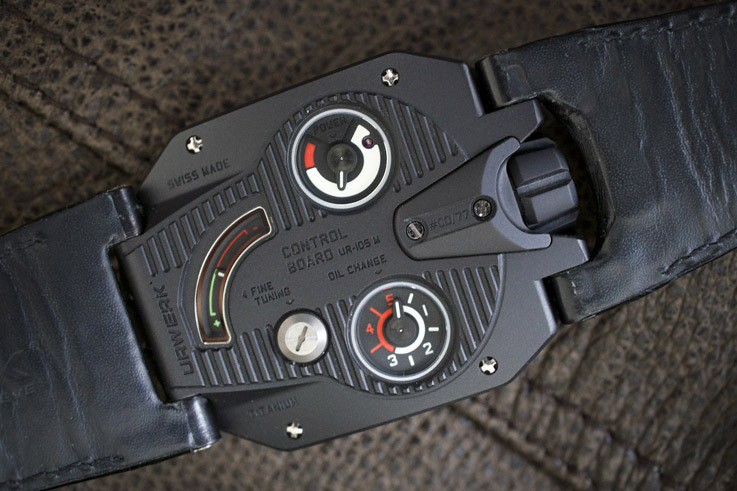 This feature is so typical URWERK and one of the coolest visible features, it is also an URWERK exclusive. While I am writing this article, I look at the red seconds passing by, through the small sapphire crystal window on the side of the case. The second window, next to it, is a lateral power reserve indicator. When the watch is fully wound it is white and it is very slowly turning to black, when it has consumed most of its 42 hour power reserve. 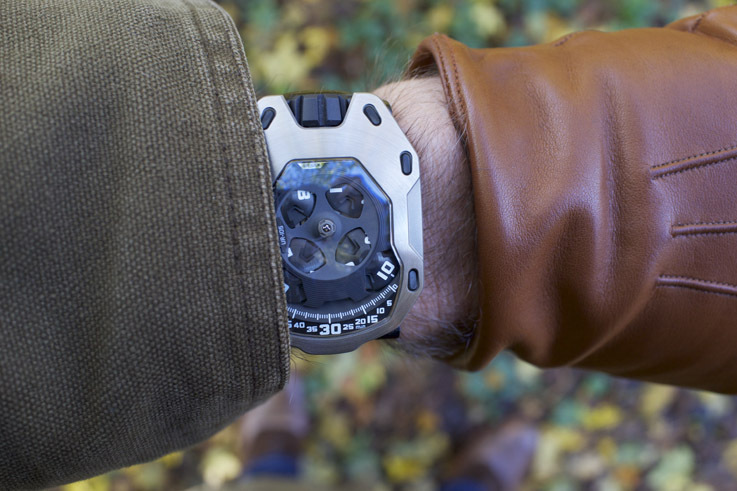 The UR-105M is, compared to the UR-103, a more sturdy watch. The materials used for the case make it an easier to wear daily watch, than the vulnerable gold ribs of the 103 series. During the past few weeks I never feared that something could happen to this watch, no matter what I was doing. 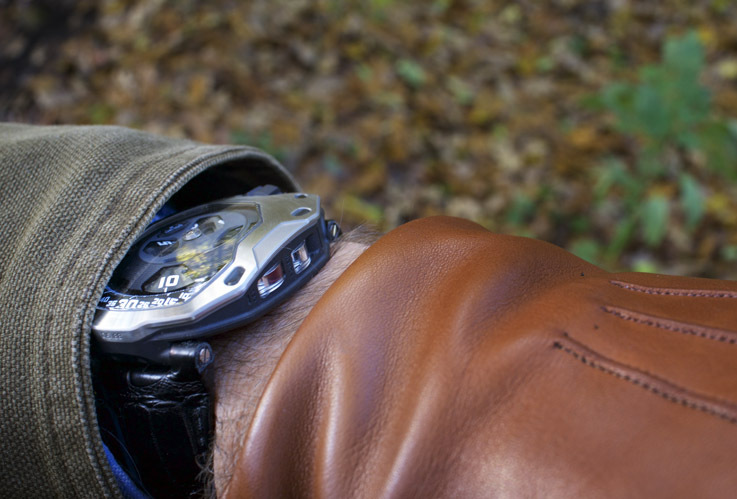 Rough and heavy coats, zippers, sportswear, bad weather are all factors that were never a reason not to wear the watch, something I can’t say about the more precious UR-103. The metals chosen and the construction of the case make it a tougher and more masculine watch. While the UR-105M does have a lot in common with the UR-103, the fit is different, probably due to the slightly larger case. As far as now URWERK will produce 77 pieces of the ‘Iron Knight’ and another 77 of the ‘Dark night’. What will be next is always the question, but I cannot imagine that here will not be another variation of the UR-105M in a different material, since just 77 pieces will be sold out too easily and too fast.